Flat screen, LCD, LED and OLED TVs are the hottest trends in the Home entertainment. 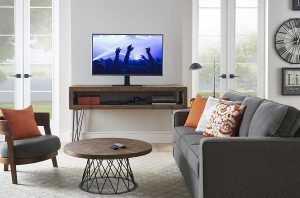 With the prevalence of these flat Screens, compact media furniture options like the TV stands with mounts are also becoming increasingly popular. 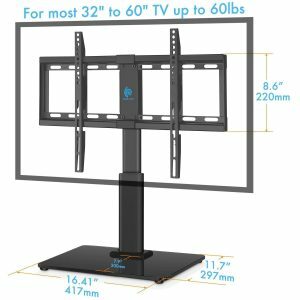 If you are transitioning from conventional TV to Flat screen TV or upgrading your small LCD TV to a larger OLED Television, purchasing these stands will offer you numerous benefits. The main benefits it that they create a stunning and sleek look. They also project a theater like an ambiance at home. Unlike the wall TV mounts, you will get a gorgeous look without damaging your walls. Another significant advantage of these stands it that they enable you to keep your TV safe and stable. What’s more, thanks to their adjustable design, setting the TV at your preferred position will be a breeze. 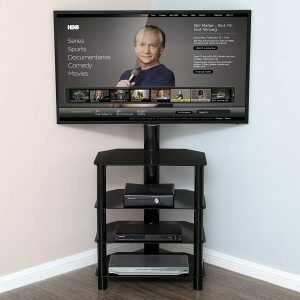 In this guide, we have reviewed the top selling best TV stands with mounts that comes with advanced features to deliver both style and tidiness. Since they come in different sizes, go through each model and choose the model that is compatible with your TV size. If you don’t have the luxury of space, but you still want to secure your TV securely, then the FITUEYES TT104001GB might be your best pick. This Stand is designed to accommodate standard sized TVs from 27 to 37 inches. This makes it an excellent choice for gamers as well as office use. They are also great for individuals with smaller living rooms. Despite its compact design, the mode comes with a stable base that ensures that your TV is safe. Pairing an elegant and fully functional design, this unit will also blend well with your room décor and other furniture. It features a black and glossy finish that gives your home an elegant look. The unit is also easy to adjust allowing for the best views from all angles. Other than this, the stand boasts of a simple assembly and includes a cable management to keep your place organized. TAVR TW1001 TV Stand is an excellent choice as it offers you a better view. It is made of high-quality materials to ensure unmatched durability and reliability. The stand is height adjustable allowing you to set it at the appropriate height. It comes with a steel frame plus a stable tampered base that is strong enough to hold televisions weighing up to 100 lbs. Apart from this, the stand boasts of VESA pattern that allows it to accommodate TVs from most brands measuring from 32-55 inches. Additionally, this stand offers you with two shelves for organizing your gadgets. Other than this, the unit also comes with a wire management solution that keeps your cable organized. Save your living space without drilling holes on the walls. The FITUEYES corner TV stands are designed to utilize the corner space, which is often left idle. Don’t take its compact design for weakness. On the contrary, this TV stand is made of high-quality materials that ensure greater load bearing. The Set handles larger weighing up to 40KGs. It also comes with an adjustable height feature that allows you to set the TV at your desired height. More to this, it also comes with a swivel design that allows you to watch the TV from all angles. The bracket boasts of a VESA pattern that enables it to accommodate various sized TV flat screens from different brands. Another great feature that makes this unit stand out is the four-tier shelves that provide you more than enough space for storing your gadgets. The shelves are made of tampered class that boasts of impact and bending strength ensuring durability. Additionally, the unit has a cable management integrated to help you organize the cables for easy cleaning and convenience. This universal TV stand does not only look great, but it doesn’t take a lot of space. This makes it a great choice for individuals who are looking to save space. We love it includes a shelf that holds all your components and DVDs. The stand also comes with a smart design that swivel is allowing you to adjust the position of your TV. Unlike other models that you will need to twist the base, only the holding mount will adjust for added convenience. More to this, the stand comes with an adjustable height feature. The Holding bracket has three adjustable heights that allow you to mount the TV at your preferred height. 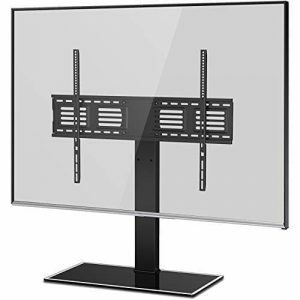 Additionally, this unit comes with a VESA compatible system that allows it to hold most 50- 80-inch televisions on the market weighing up to 80 pounds. Boasting of modern and stylish design, this universal TV stand from PERLESMITH is a great choice for people with small studios and apartments. It is designed to hold 32-47 inch flat panel TVs. Despite its compact design, this model still manages to offer a decent service. First, it comes with a height adjustable TV bracket that enables you to set the TV in three different positions. Secondly, the model comes with extra security wire and a rubber foot to ensure maximum stability. When it comes to durability, this model also stands out. Apart from being, made using powder coated steel frame t, it also boasts of the VESA universal system that enhances its stability. Moreover, this unit includes all the installation accessories and hardware making its installation a breeze. Are you looking for an easy way to revamp your entertainment set? You don’t need to purchase a new TV set or add a soundbar. By simply replacing your old TV stand with the Kanto MTM65PL Stand, you will give your space the glow it needs. This stand comes wits quick release wheels that let you roll the TV set easily. After setting the TV where you want, simply lock the wheels to ensure it remains in a stable position. Kanto MTM65PL stand is crafted from premium quality steel that is powder coated to ensure durability. The stand is incredibly stable and holds TV sets weighing up to 100 lbs. What’s more, it also boasts of an adjustable middle tray that you can use to organize your gadgets. Above all, the stand is precisely made to accommodate most flat-screen TV panels from 37 to 65 inches. If drilling holes on your wall to install your TV is not your thing, then you will love the HUANOU universal tabletop TV stand. You simply need to place the stand on your table or desk for a secure, beautiful, and organized look. The stand is height adjustable to four positions allowing you to set it at your recommended height. The set also boasts of a universal compatibility thanks to the integrated VESA system. We also love its universal Swivel design that allows you to View the TV from different angles. 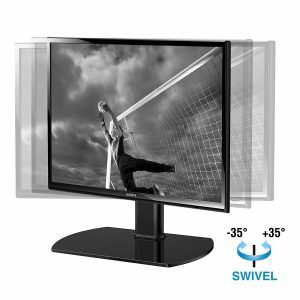 You can swivel the TV from +/-20 degrees, preventing glare as well as saving space. Above all this set is made of heavy-duty steel frame and thick tempered glass base ensuring that your TV is held safely. For those looking to upgrade their televisions, you also need to ensure that you pick a stand that complements your TV. This is a smart design TV stand that will fit all the modern Plasma, LED, OLED, and LCD television. To ensure best in class stability, the stand features an all-around steel frame. It has also undergone multiple tests to ensure safety and reliability. 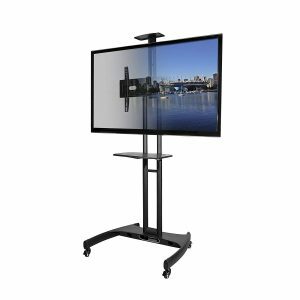 With a maximum load capacity of 130pounds, this stand is built to hold heavy and large televisions comfortably. Unlike other models, you don’t have to worry about moving your television. This set comes with four mounted wheels that provide smooth and easy maneuvering. These wheels are also lockable to prevent accidental rolling. Another feature that makes this unit stand out is the integrated motor that lowers or lifts your TV by simply pressing a button. Its versatile design makes it a great choice to use almost everywhere including in your home, bar, restaurant, gym, etc. above all this unit comes with a self to organize your gadgets as well as an integrated wire management system to keep your space organized. 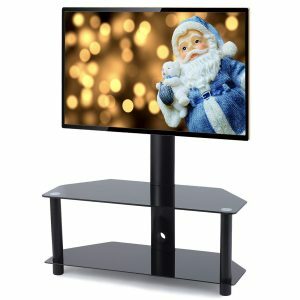 Has a well-built frame and a sturdy base that holds large Televisions? Your gorgeous TV has finally found its muse, and your Home entertainment will definitely become much well. Boasting of sophisticated and functional design, this TV might seem hard to install. Interestingly installing it does not take more than 15 minutes. This is because it comes with all the needs hardware and accessories. Customizing the look of your TV has never been easy. This unit comes with a four-height adjustment that allows for the correct positioning. This is not all; this unit comes with 75 degrees of total swivel. This will enable you to save not only space but also fight glare from brightly lit rooms. Another exciting feature that comes with this unit is a beautiful shelf that lets you organize your stuff. Let’s face it; you will need a place to keep your PS4, Xbox or even your satellite cable. The shelf will enable to keep all your stuff organized. 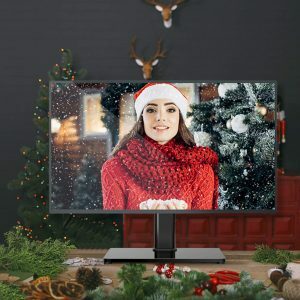 Some of the other impressive features you will love about this model include the sturdy construction, cable management, as well as smart design that complement the look of your TV. Engineered to hold Plasma, LCD, LED, and OLED TV stand, this is the most appropriate TV stand for those looking to upgrade their Televisions. It boasts of a black Piano finish that brings a sleek look that blends well with other furniture. Besides the impressive look, this set also comes functional futures that ensure that you get the best service. As you would expect this stand has an adjustable height that allows you to position the TV at your desired height. The stand also has a swivel design that adds flexibility. With this model, you can now position your TV up to 45 degrees in each direction to suit your needs. Other than this, the stand is made of sturdy materials allowing it to hold a TV weighing up to 80 pounds. Additionally, this television comes with all the hardware required, making its installation easy. The variety of products on the market is a blessing and a curse. Starting on the bright side, the various models give you a wide choice allowing you choose the model that suits your needs. However, the tones of products available have a close resemblance, making it hard for you to make up your mind on the best to select. Below are some of the features to help you make an informed decision. Construction materials: The construction materials determine the stability and long-term service. The best TV stands are made of sturdy construction materials. We prefer models made of either steel or aluminum. They should also include tempered glass to ensure durability. Additionally, the base needs to be non-slip for added stability. TV size: Similar to other furniture, the TV stands come in different sizes. 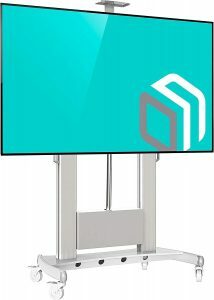 While the size of the Stand doesn’t always mean it holds a bigger TV, a larger model will accommodate bigger TV screens. Here you need to be aware of the screen size you have. Luckily, the TV stands handle small TVs from 24 inches to Monster 100 inch TV. 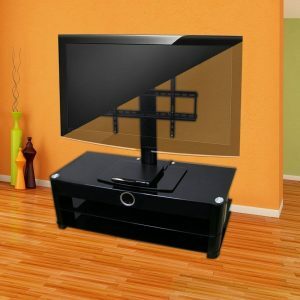 We recommend going for TV stands that are adjustable should you think of upgrading the TV. Maneuverability: Another crucial aspect to consider is the maneuverability. If you have a large home, an immobile stand may be an appropriate choice since you don’t need to move it often. However, if you live in a small apartment, moving your TV to create space may be the wisest thing to do. If this is the case, you should go for models with smooth rolling and lockable wheels. Swivel Adjustability: Finally, yet importantly, you will need to ensure that you pick a stand that is adjustable. Besides ensuring that it is adjustable to different heights, the stand also needs to have a swivel of above 45 degrees. This will help you fight off glare and set it in a position where every person will get a good glimpse. Depending on the TV you have or intend to purchase, the above Stands with mounts are a great choice. These stands do not only come with the latest features but also are incredibly easy to assemble. They are also durable and easy to adjustable. Go through each of them and purchase the one that meets your needs.